Interactive Narratives and Transmedia Storytelling provides media students and industry professionals with strategies for creating innovative new media projects across a variety of platforms. Synthesizing ideas from a range of theorists and practitioners across visual, audio, and interactive media, Kelly McErlean offers a practical reference guide and toolkit to best practices, techniques, key historical and theoretical concepts, and terminology that media storytellers and creatives need to create compelling interactive and transmedia narratives. McErlean takes a broad lens, exploring traditional narrative, virtual reality and augmented reality, audience interpretation, sound design, montage, the business of transmedia storytelling, and much more. Written for both experienced media practitioners and those looking for a reference to help bolster their creative toolkit or learn how to better craft multiplatform stories, Interactive Narratives and Transmedia Storytelling serves as a guide to navigating this evolving world. "In an age of ubiquitous social media, interaction is the new normal. Pitched precisely on the leading edge of media theory/practice and industry/academy interests, Interactive Narratives and Transmedia Storytelling is a best-of-both-worlds, how-to guide for practitioners (AKA creatives) across the relevant multidisciplinary and cross-platform fields of research, pedagogy and commercial production. Grounded in a confident, non-jargonistic understanding of narrative (and narration and narratology), this book deep-mines scholarly explanation of the customarily closed-circuit of ‘classical’ (linear-consequential) and non-linear (avant-garde) storytelling in TV, cinema, photography and fine art, in order to apply key conceptual insights, tools and techniques to the aesthetic practice of making of innovative digital forms, open to two-way and multilinear fictive plotting. Staying current with fast-changing genres and supporting technologies will of course always be tricky. To that end it is surely wise, as in this instance, to situate the work conceptually and in relation to a range of writers and approaches. In debt to the modernist praxis of pioneers such as Brecht as well as the example of Hollywood auteurs, notably Hitchcock, the reader will appreciate McErlean’s skilled use of recurring focus on key objects of analysis, illuminated through a critical compass of perspectives and practices." "A storytelling future has arrived and here is its Book of Revelation. McErlean shows us how, five centuries on from Caxton, we can engage with new technologies to transform the familiar immersive experience in ways previously only imagined, and be inspired to connect anew both inside and outside of ourselves." "The digital world is full of paradox; reading is crucial to master its development. 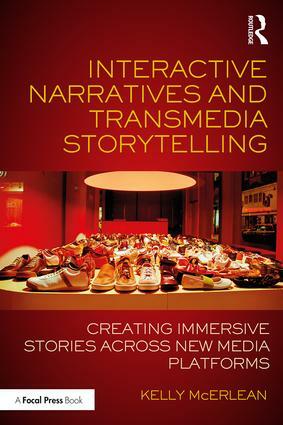 If you want to be serious about interactive narratives and transmedia storytelling, this book is for you. The author is adamant about it: ‘Reading is not always easy as many worthwhile texts require significant effort to get through . . . I have always promoted the importance of critically analysing narrative texts.'" Kelly McErlean has developed graduate and postgraduate programs in film and new media for local and international delivery and successfully delivered eLearning and onsite contracts for international broadcast organisations on behalf of the European Broadcasting Union. Kelly lectures on new media, film and entrepreneurship at the Department of Creative Arts, Media and Music, Dundalk Institute of Technology, Ireland. He has won several awards including a Golden Spider Award and a Digital Media Award for his film, new media, and photographic works. Kelly holds a PhD in visual culture from the National College of Art and Design, Dublin.